One of my favorite things about going to the movies is watching the "trailers" or "previews" that precede the main feature. I enjoy the glimpses of things to come and the anticipation that they foster. Last week, the Centers for Medicare & Medicaid Services (CMS) offered a preview of the 2013 Medicare physician fee schedule in the form of a notice of proposed rule making (NPRM) published in the Federal Register. You can download a copy of the NPRM and view related links(www.cms.gov) on the CMS website. As usual, the proposed rule for next year's fee schedule is full of interesting payment policy proposals. 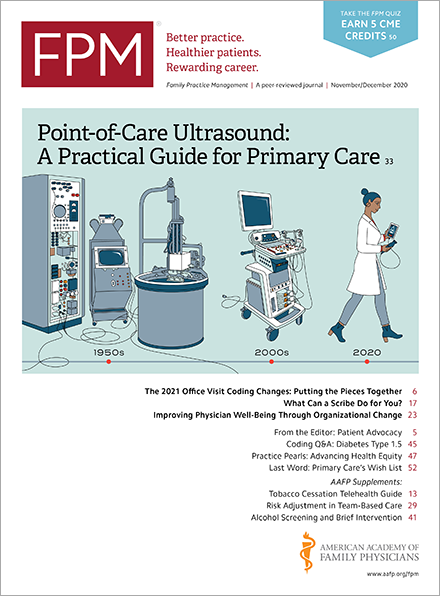 From a family medicine perspective, the most interesting one is a proposal to create and pay for a code that community physicians may report when they manage the care of a patient who is transitioning from a facility to an ambulatory, outpatient setting (e.g., from the hospital back to the community). CMS recognizes that a lot of expensive re-admissions could be prevented if transitions of care were better managed, and CMS appears willing to pay community physicians, including family physicians, for doing just that. CMS estimates that this proposal alone will increase Medicare allowed charges to family physicians by 5 percent in 2013. Of course, not everything related to the Medicare physician fee schedule is good news. CMS separately estimates(www.cms.gov) that, under current law, the physician fee schedule conversion factor will decrease 27 percent on Jan. 1, 2013, unless Congress and the President again intervene in the process. CMS is accepting comments on its proposed rule until Sep. 4, 2012, so if you want to provide any feedback that may help shape the final product, you will need to submit it between now and then. Options for how to submit comments are included in an early section of the NPRM. CMS plans to publish the final rule on or about Nov. 1, 2012, with implementation effective Jan. 1, 2013. Think of it as "show time" for the 2013 Medicare physician fee schedule. Here's hoping that the final product is more of an uplifting picture than any sort of comedy or horror show.